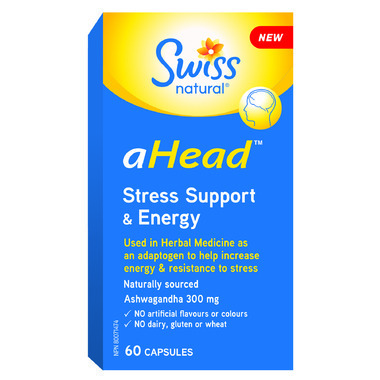 Swiss Natural aHead Stress Support & Energy supplements are made with Ashwagandha (Withania somnifera) which is traditionally used in herbal medicine as an adaptogen to help increase energy and resistance to stress (e.g. in case of mental and physical fatigue related to stress) and as a nervine to help relieve nervousness and restlessness. Traditionally used in Ayurveda for memory enhancement, to relieve fatigue and general debility especially during convalescence or old age. Recommended Dose: Adults: Take 2 capsules daily. Ingredients: Ashwagandha 5:1 root extract 300mg. No artificial flavours, colours, sweeteners. NO preservatives, dairy, soy, gluten, wheat or yeast. Caution: Consult a healthcare practitioner prior to use if you are pregnant or breast-feeding. Consumption with alcohol, other drugs or natural health products with sedative properties is not recommended.